I made these muffins earlier this week and out of a dozen muffins our 4 year-old daughter ate six in a two-hour period and was still wanting more! Her new favorite muffin? Apparently so! As she kept asking for more I hesitated and then reasoned, “you know, why not? We rarely let our kids eat candy or junk food. And these muffins have no refined flour or sugar and only a little honey per muffin…they’re healthy.” And so I handed her another one. 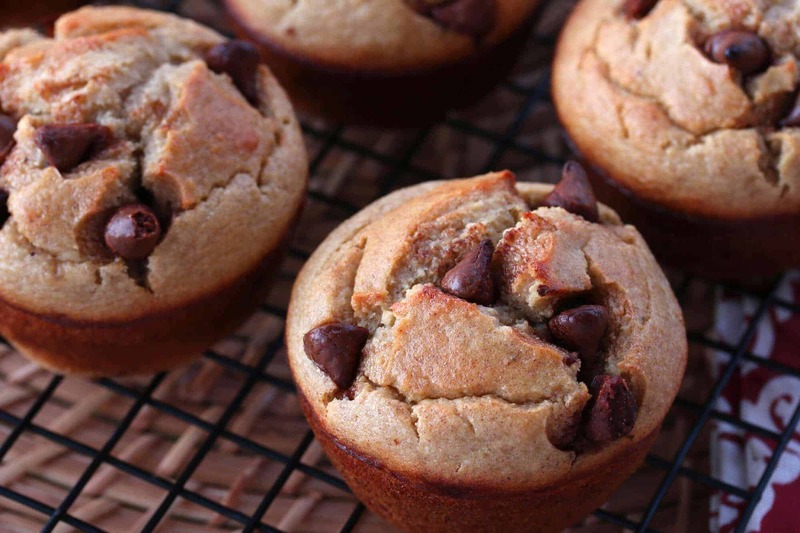 Not only are these muffins nutritious and delicious, these are seriously the easiest muffins ever: Dump all the ingredients into your blender, puree it, stir in some chocolate chips, pour it into the muffin tins and bake. From start to finish, it takes less than 5 minutes of prep time and the result is a healthy and delicious muffin with a great texture! For the bran you can use either oat bran or wheat bran. Wheat bran has the highest fiber content, over 40%, and is rich in insoluble fiber, so it’s a great choice for preventing constipation and promoting a healthy digestive system. Oat bran contains about 17% fiber and that’s mostly a soluble fiber called beta-glucan, which helps lower blood cholesterol and keeps your hearth healthy. Oat bran also tastes better than wheat germ. Both have some advantages and it just depends on what you’re looking for. 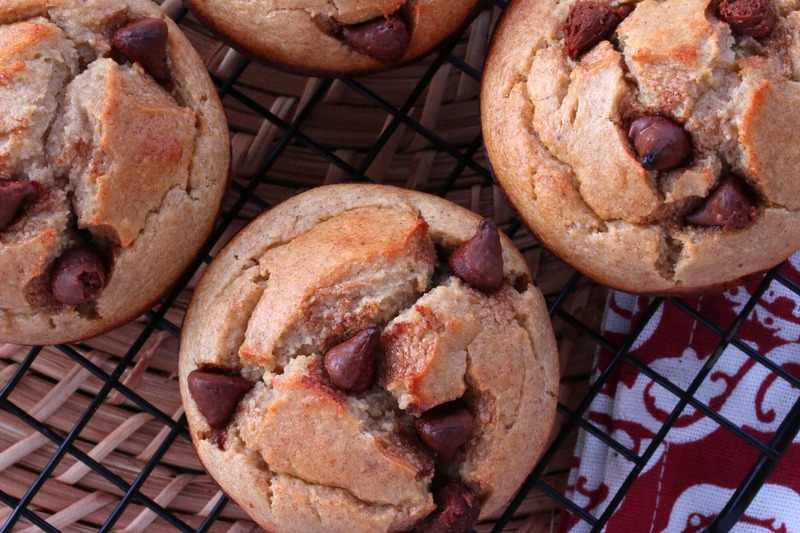 These muffins are already naturally gluten-free and if you’d like to keep them that way, use oat bran. 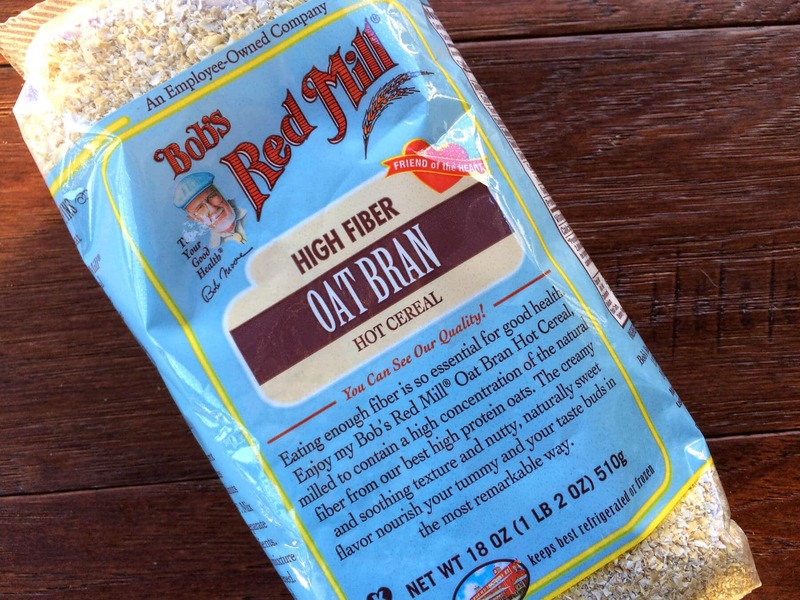 Bob’s Red Mill and other brands also make GF oat bran. 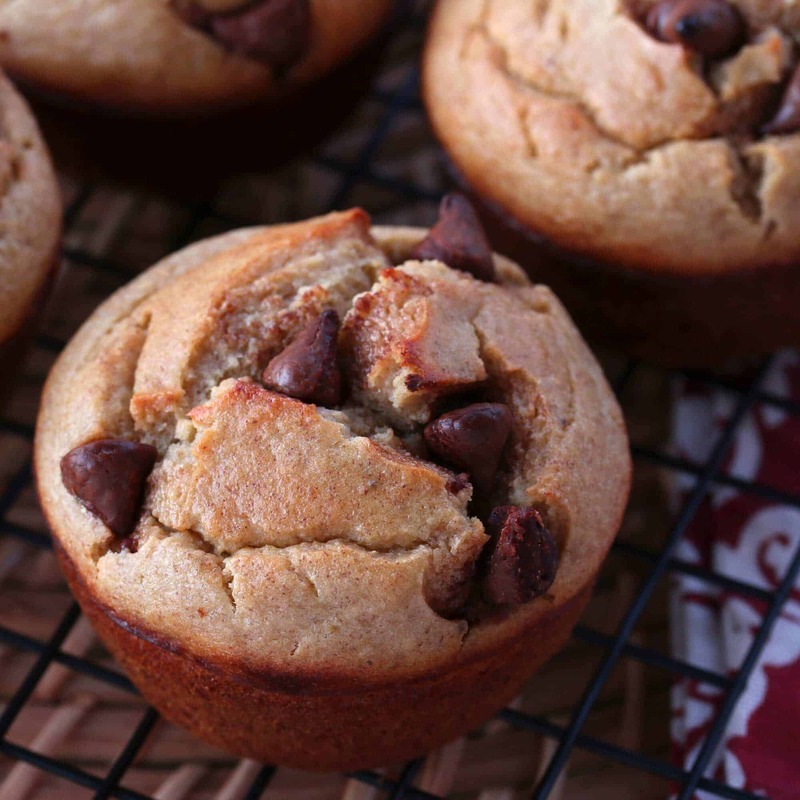 Whichever route you go, you’re going to LOVE how simple and quick these muffins are to make, how nutritious they are, and how great they taste! These muffins are made without flour, refined sugar or fat. 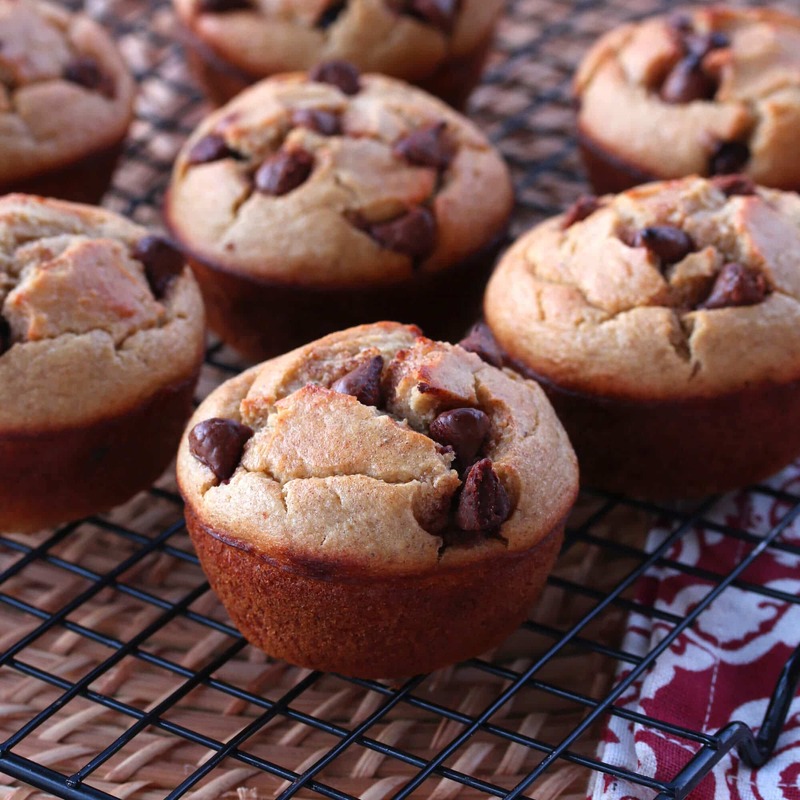 Packed with nutrition, with a great flavor and texture, these muffins are perfect for your on-the-go breakfast or as a healthy snack. And feel free to experiment with different mix-ins of your choice! 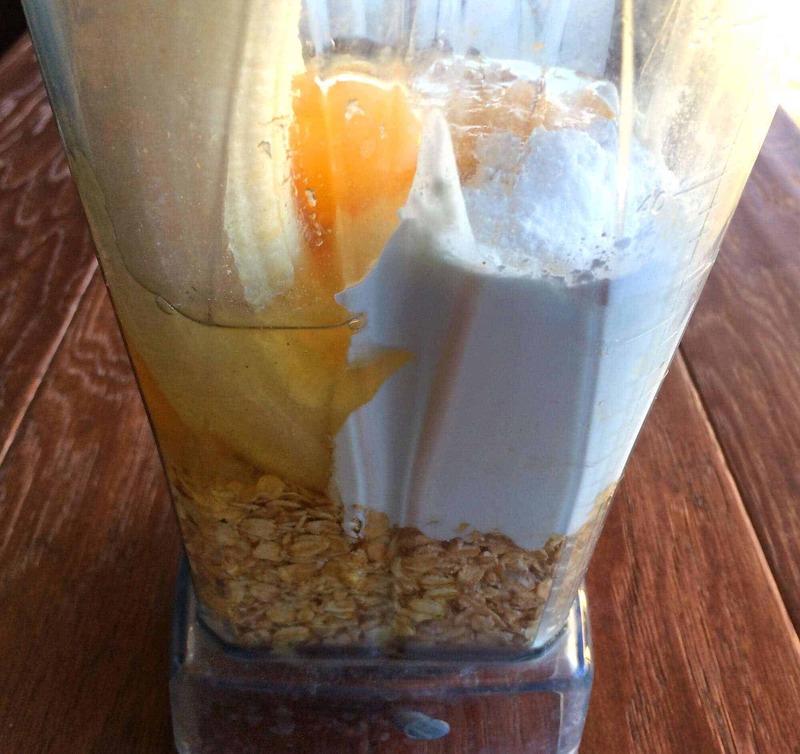 Place all of the ingredients, except for the mix-ins, in a blender. Process for about a minute or until smooth, scraping down the sides as necessary. Stir in some chocolate chips or mix-in of your choice. 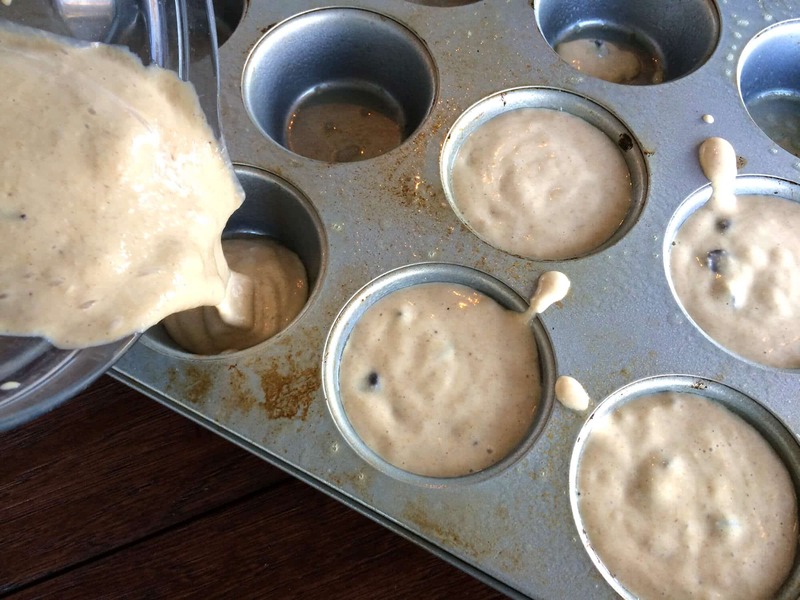 Grease or line a muffin tin and pour the batter in to just over 3/4 full. Sprinkle a few extra chocolate chips on top just to make them prettier. Bake the muffins in an oven preheated to 400 degrees F for about 15 minutes or until golden. Let them cool in the muffin tins for a couple of minutes before taking them out and placing them on a wire rack to cool. The muffins are best eaten once they’ve cooled down a little bit but are still warm. Made without flour, refined sugar or fat, these quick and easy muffins are healthy and delicious! 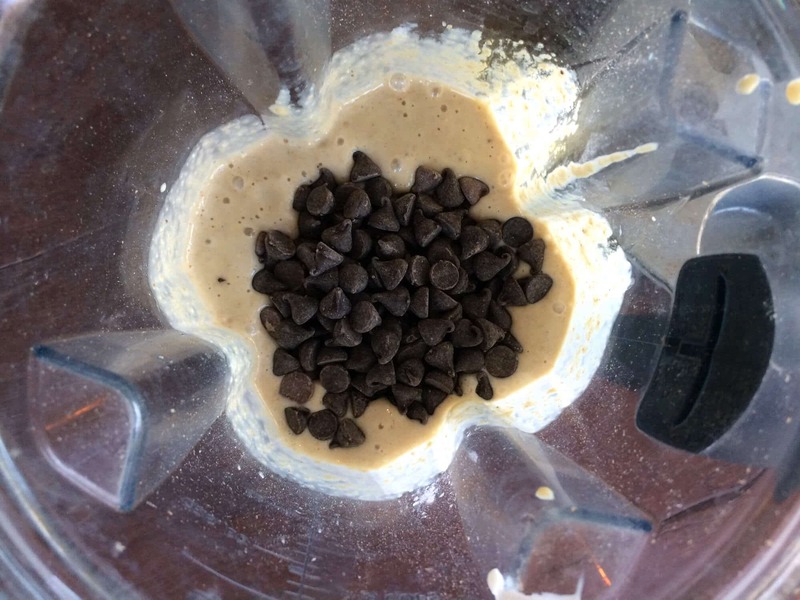 Place all of the ingredients except for the chocolate chips in a blender. Process for about a minute or until smooth. Stir in the chocolate chips. 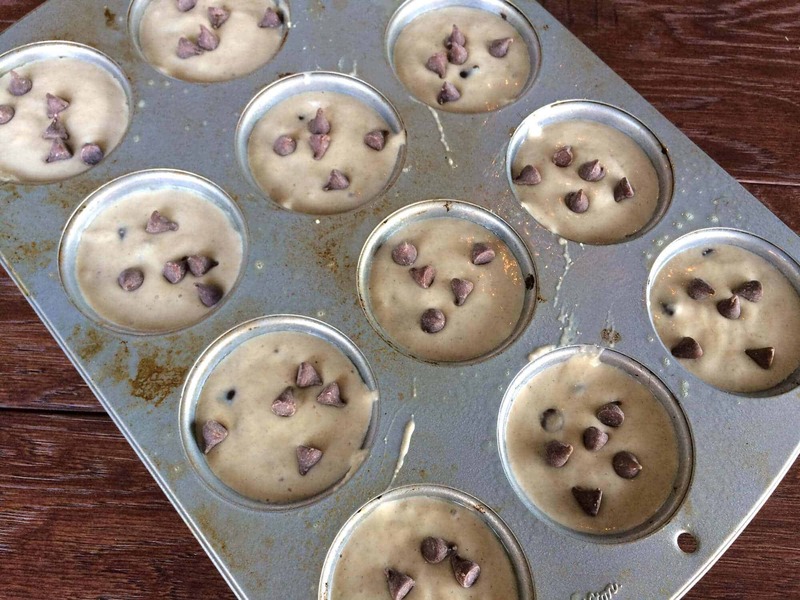 Pour the batter into the muffin tins just slightly more than 3/4 full. Bake for 15 minutes or until golden. Let the muffins sit in the muffin tins for a couple of minutes before transferring them to a wire rack to cool. Best eaten once slightly cooled but still warm. Greetings again from Norway! Wow, these look amazing. I’ve been looking for a good recipe for some treats to take on the next cross-country skiing trip as I’m trying to buy fewer processed chocolate bars this season, but some sugar is essential for a 6 hour skiing trip in -10 degrees Celsius. Think they could even be suitable for lunch boxes owing to the lack of flour and refined sugar. Yum! With that little bit of chocolate I’m sure the kids are going to love them. Thank you, Kimberley! Perfect, but would a substitution additional rolled oats for the oat bran work? Yes, Ruth, just add an extra half cup of rolled oats. Happy baking! Blender muffins?! Obsessed! This will be a great grab and go option in the mornings. Hi, I wondered how well these keep in an airtight tin/box? Would they freeze/defrost well also? Hi Mar, they keep for about the same length of time as any muffin – stored airtight they’ll keep for about 2 days at room temperature and for a few days in the fridge. I haven’t tried freezing them yet so I’m not sure. I recommending reheating them for a few seconds in the microwave because I prefer them a little warm. What is the nutritional value of one muffin? Hi Debs, there are a few websites that will calculate the entire nutritional breakdown for you for free in a second. For example, fitday and caloriecount. You simply enter the ingredients and quantities and it generates all that info for you. I made these today and they’re terrific! So quick and easy, this will be one of my regular go-to’s for a healthy snack. Thanks for sharing this! 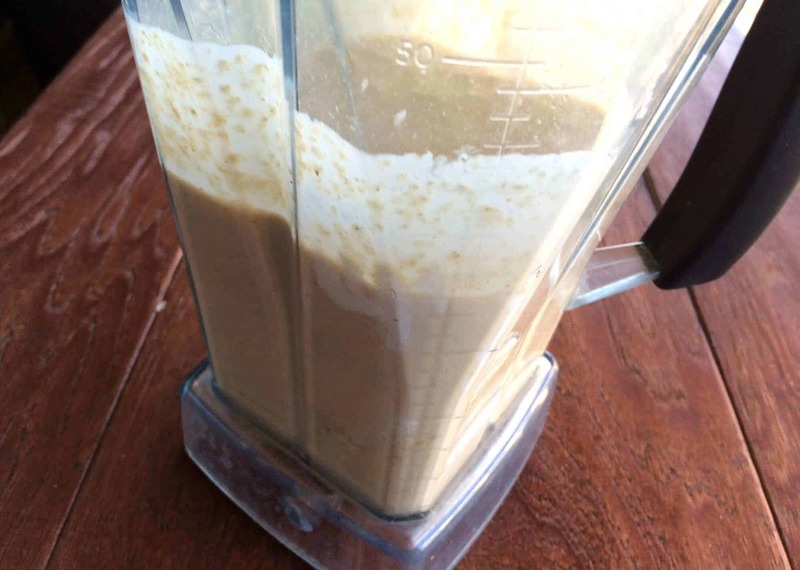 I love anything I can whip up in the blender! 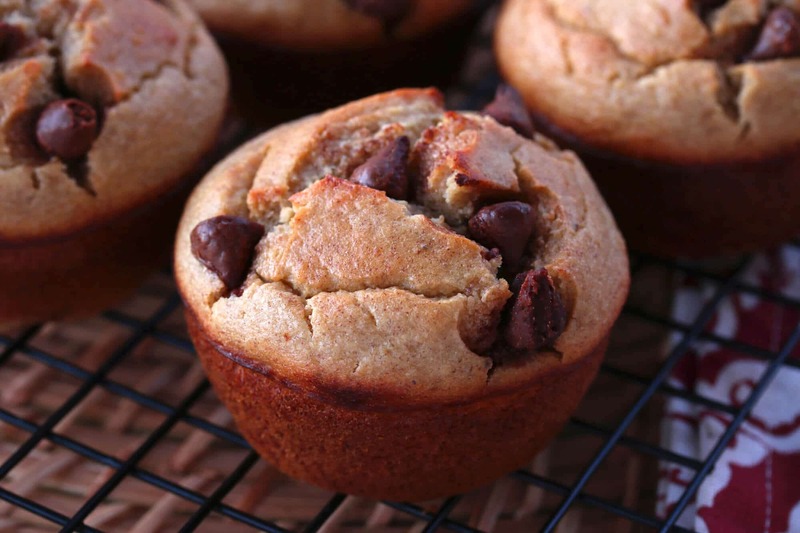 Especially these high fiber, banana, chocolatey muffins!! YUM! 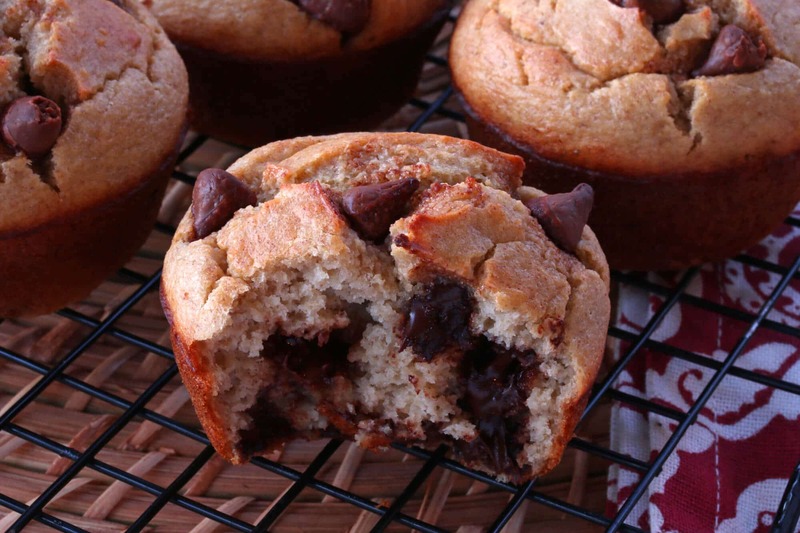 Oooh, the texture of these muffins looks perfect! I love how healthy they are, plus the fact that they’re so easy to whip up! I am a huge fan of the blender recipes! I love that these can make a great grab and go breakfast that is easy to make! What a perfect way to start the day! I can’t believe I haven’t made muffins in the blender yet! 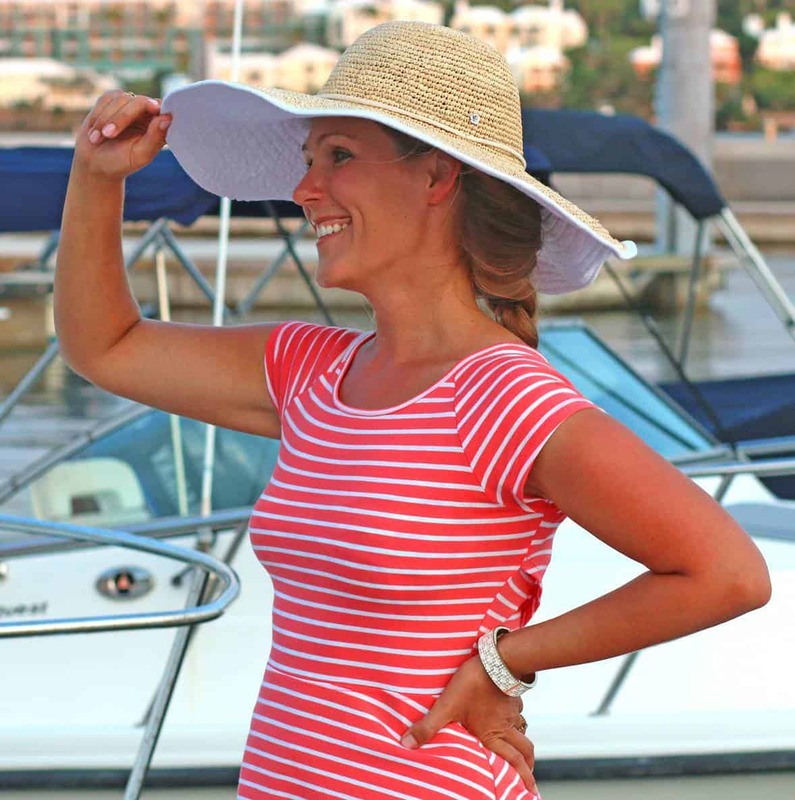 They look amazing — who could blame your daughter for wanting a few! I need to try these. Made blender muffins once and they were a fail. Look forward to trying your recipe! Yum! I would love to have these for breakfast in the mornings! These are perfect! I appreciate the ease and nutrition packed in the muffins! Perfect breakfast for kiddos! I love the flavor combination in these muffins! My kids eat muffins that quickly, too. I’ve learned to make a double batch so my husband and I can actually get our hands on a couple of them. Love the healthier ingredients in this recipe! I am so looking forward to making these tomorrow! A cautionary tale for those intending to use these as a breakfast meal, though: If my calculations are correct, the total protein content (made exactly as described, invluding the 3T of peanut butter) is something just shy of 5 grams per muffin, which is probably fine for your little ones, and as an adult snack, but even two muffins by themselves wouldn’t be enough for an adult’s breakfast meal. Awesome, Adrienne! I just made another batch of them, Adrienne, this time with peanut butter. Agreed – eating these and nothing else doesn’t represent a “complete breakfast” anyway. Just curious -if we don’t want to use peanut butter, what else should we use…or can we just leave it out? …looking forward to making these tomorrow! Hi Anna, no substitutions needed, simply omit it. Happy baking! 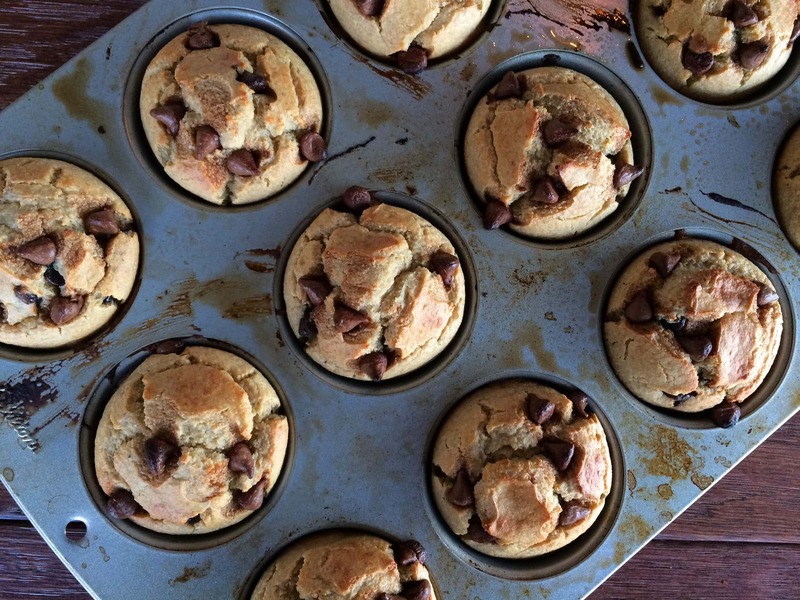 I have a little muffin lover at our house too – I think these would be a hit!